I've been rocking the sea green polish all summer and was jonzing for some change. The neon red didn't really do the thing for me past the weekend so I decided I would take the chance to expand my nail horizons. I had contemplated the "one nail different" trend but was some what hesitant at its possibilities of tackiness. Don't get me wrong, I love out-of-the-box looks, but when it comes to my nails I'm a matte color kinda girl. Once I find a color I get stuck. 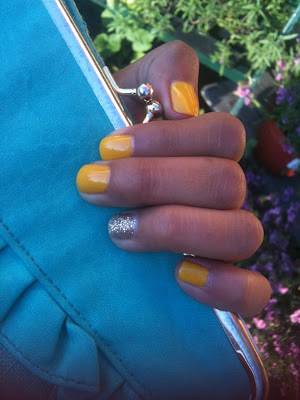 I decided to seize the moment and add a bit of gold glitter glam to my yellow nail inspiration.